To ensure the template would print to the correct size, you can follow this tutorial. It shows of what to set-up using different browsers. Please note all dimensions are expressed in imperial units which are inches and feet. Measure the axle tube diameter, which indicates the capacity of the axle. Remove the wheels from the axle. Place a straightedge along each hub face. Measure the distance between them. Measure the distance from one spring center to the other. Do so by holding the end of the measuring tape to the center of the hole to the center of the other hole. Measure the distance between the holes. You now have the basic dimensions needed to order a spring axle. Gather the following: an assistant, a tape measure, two straight edges, a bolt circle template, a notepad, a pen, and a digital caliper. 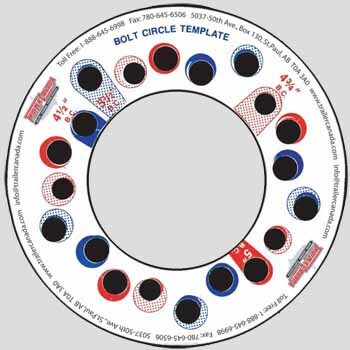 Measure the bolt circle pattern using a bolt circle template. Measure the start angle of the suspension arm. The start angle of the suspension arm can vary from twenty five degrees up, twenty two and a half degrees. Measure the outside to outside frame width of the trailer. Using a couple of straight edges placed along the face of each hub, determine the hub face to hub face measurement. It is important that we get precise measurements from you so that the axle will fit. 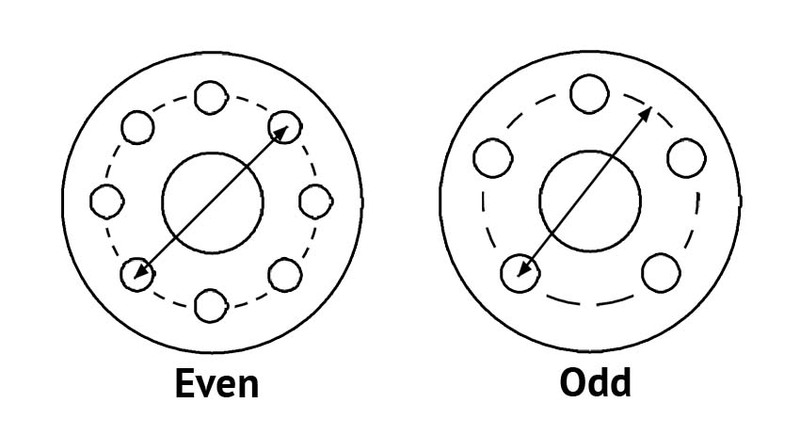 Match wheels to hubs by the number of bolts and bolt circle pattern. To determine the bolt circle on wheels with an even number of bolt holes (4 on 4”, 6 on 5 ½” or 8 on 6 ½”), measure center-to-center on bolt holes directly across from each other (see illustration). On odd number bolt wheels (5 bolt), measure any bolt hole center directly across to other side half way between two bolt holes to a point on an arch drawn between the two holes. (see illustration) (Example: 5 on 4 ½ would mean 5 bolt holes with 4 ½” measured to a point on an arch halfway between the opposite bolts). Offset is the distance between the mounting face of the disc and rim centerline.